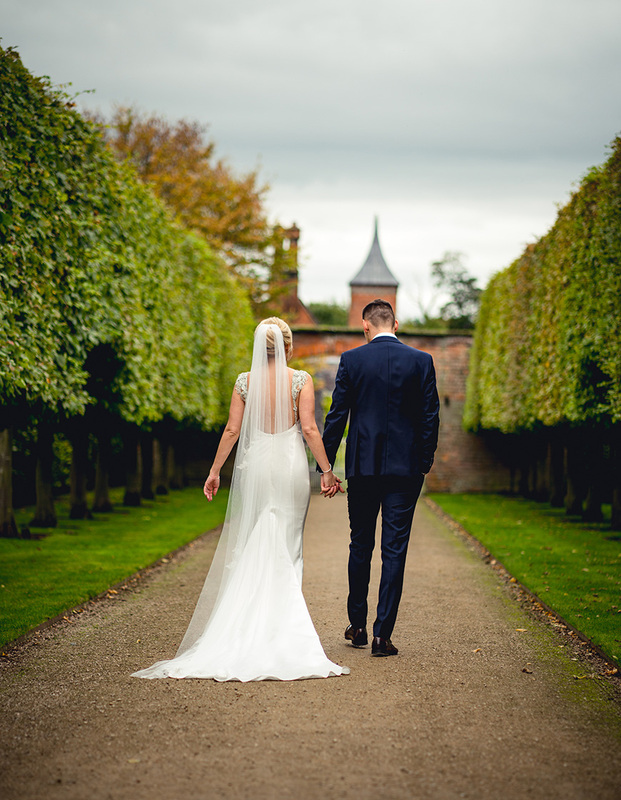 Choosing a Cheshire wedding venue for their dream day, Kate and Scott’s October celebration at Combermere Abbey embraced the beautiful indoor spaces as well as the glorious gardens. 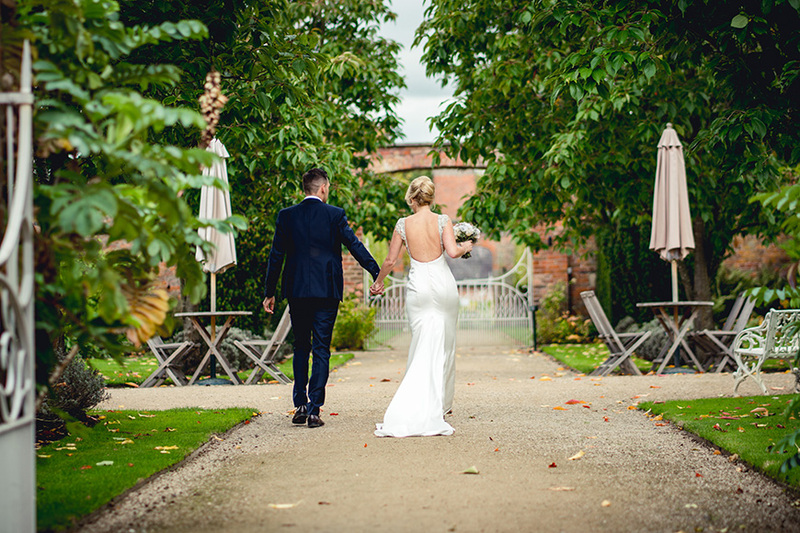 With an October wedding date in mind, Kate and Scott were looking for a wedding venue in Cheshire where they could marry and celebrate with their friends and family. 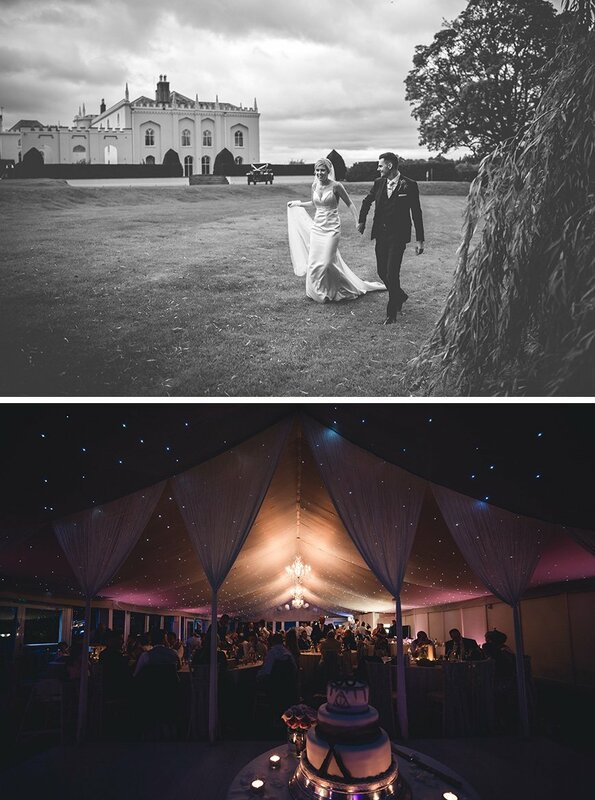 They quickly fell in love with Combermere Abbey. Settling on an elegant colour combination of lavender and navy, the happy couple didn’t have a specific theme. Instead, their focus was to emphasise the importance of family and friends, including photographs from special times in their lives. “We kept the look quite simple, just using lanterns and candles to decorate the Glasshouse and the Pavilion,” says Kate. As well as adorning the venue with photographs, each table was named after a photograph, from ‘the one where it all began’ to ‘the one where we graduated’. “It took a while but it was a great way to show our love to our friends and family,” smiles Kate. Candles sat on slate on the centre of each table, a lovely contrast with the white sequined tablecloths. The beautiful bride wore a stunning gown by local designer, Claire Mischevani. Kate completed the look with a pair of Jimmy Choo shoes and a fabulous cathedral veil. When it came to the groomsmen, Scott hired navy suits from Moss Bros. Meanwhile, he chose a tailored suit from Moss Bros for himself but added some personalised details. Last but not least, Kate’s bridesmaids wore low-backed lavender dresses from ASOS. Following their romantic ceremony in the Glasshouse, drinks and nibbles were served in the centre of the maze. Music played a key role on this special day with a piper playing as guests arrived and the best man singing and playing guitar during the drinks reception. Moving in to dine, a delicious menu started with caramelised onion with mozzarella on ciabatta, moving on to sausage and mash and, for pudding... Jammie Dodger cheesecake! As day turned to evening, a nacho bar with chilli, rice and all the toppings proved a great success. Putting thought in to their drinks as well as the food, four cocktails were created especially for the day – ‘The Mr Robinson’, ‘The Mrs Robinson’, ‘The Best Man’ and ‘The Maid of Honour’. A DJ and bongo player filled the dance floor throughout the evening and the newlyweds danced their first dance to ‘Love is At Your Side’ by Basement Jaxx.